Replacing gas with sunshine for enhanced oil recovery (EOR) is a cost-effective solution. This is the key message of US-based company Glasspoint, which has mobilised the biggest investment ever in a solar steam-producing unit in Oman. 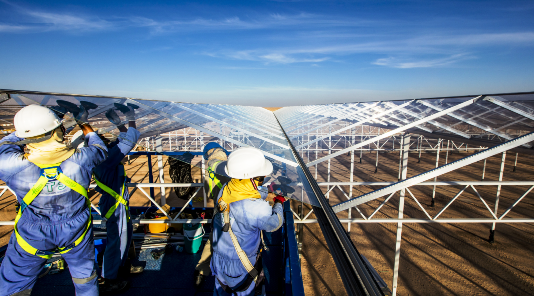 State-owned Petroleum Development Oman is building a concentrating solar thermal collector field called Miraah next to the Amal West oilfield. Once complete, it will generate more than a gigawatt of solar thermal power to drive EOR operations – saving Oman about 5.6 trillion BTUs of natural gas each year. EOR techniques provide steam which is used for heating the heavy crude oil in the ground to improve flow properties and make it easier to pump the oil to the surface. Ageing oil fields and the need to extract more crude have led to a significant increase in demand for EOR technologies. “The global EOR market was valued at USD 60 billion in 2014 and is expected to experience a compound annual growth rate of about 25 % to reach USD 225 billion in 2020,” it said in a news article in The National Business Review from 20 March, based on figures by US consultancy Zion Research. Glasspoint has more than tripled its staff over the past years and employs 325 people at seven different locations. In 2016, it was recognised as a Technology Pioneer by the World Economic Forum and took part in the forum’s annual meeting in Switzerland in January this year.